Field research reveals the Sasquatch to be highly intelligent, primarily nocturnal omnivorous foragers possessing exceptional night vision and living in small, widely-dispersed social groups. This gigantic hominin species stands from ~7-11' in height at adulthood and presents several notable cold-adapted anatomical features; being covered by thick black, brown, auburn or beige fur with facial hair covering the cheeks and forehead, and small nasal orifices that effectively minimize heat loss to endure sub-zero temperatures. The closed nasal structure of Sasquatch also allows fine control of airflow through the nose, enabling a wide range of nasal whistles, snorts and other complex vocalizations including precise mimicry of forest animal sounds, none of which is reproducible by the human larynx. The anatomical morphology of Sasquatch displays a unique combination of human and primate features. Giant footprint casts analyzed by forensic expert J. Chilcutt identified the fine impressions of dermal ridge flow patterns characteristic of an unknown giant bipedal primate. 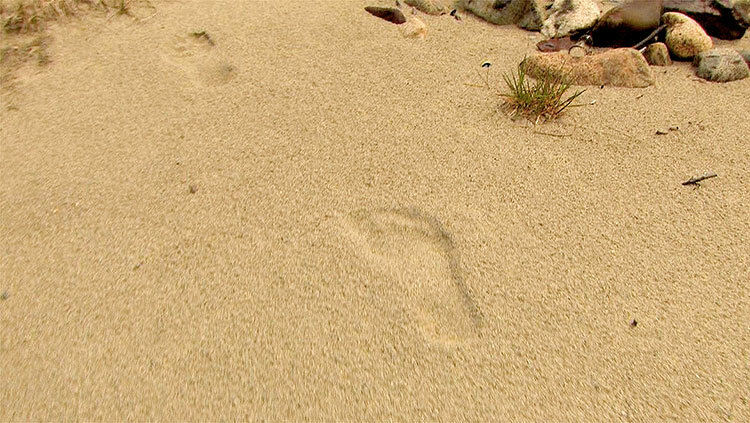 lnline tracks of 12-26" human-like footprints with 4-7' stride lengths have inspired the legendary nickname 'Bigfoot' (above). Forensic studies of giant footprint casts from Sasquatch encounters also conducted by Dr. J. Meldrum, professor of anatomy and anthropology at Idaho State University, provide unambiguous data sets concerning the primate morphology of the Sasquatch foot, revealing a flexible mid-tarsal joint that can be clearly distinguished in the Bluff Creek, California bigfoot film shot by Roger Patterson in 1967. The high level of consistency of these unique features of Sasquatch locomotion constitute an essential and conclusive form of forensic evidence confirming the reality of living Sasquatch groups. "What would happen to you if you tranquilized a grizzly bear cub? What will you do when the mother comes back? Tranquilize her too? No, you will have to kill her, or she will kill you! Now what would you do if it was not only the mother that came back to defend the cub, but the father, the uncle, the brother [or] the whole family came back to defend it? Will you kill all of them too?" "So, tell me how you will survive this circumstance when your adversary is more intelligent than the great bear, more strategic than the great bear, maintains high ground, throws boulders a has a hundred other advantages over the great bear? You don't need to tell me, I will tell you. Anger the master of the woods and you will take your last breath." Despite resistance from many local indigenous hunters and trackers, Standing has been counseled by Cree, Ojibwe, Stoney and Anishinabe First Nations Elders concerning their peoples' history of interactions with what many refer to as the 'Shadow Guardians of the Mountain'. The commonly used name Sasquatch is derived from 'sésquac', a Coast Salish name meaning 'wild man'. 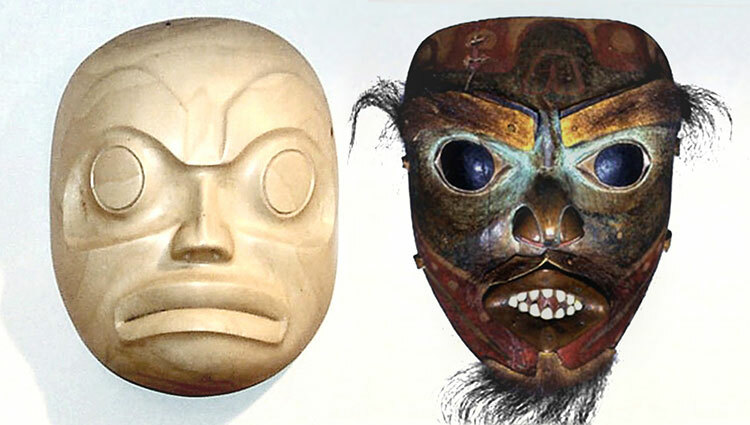 Traditional stone and painted-wood masks of First Nations cultures present the fearsome features of Sasquatch, commonly seen among Salish, Haida, Kwakiutl and Tlingit carvings (above). Often displayed with matted wigs made with human hair, the masks portray a distinctive set of facial features, including round, wideset eyes, a pug nose, protruding jaw and a very wide, fanged mouth. Local oral histories retell of paranormal events including the presence of luminous aerial objects and repeated attacks by the hairy giants in a small secluded valley called Sylvanic. Several fatal incidents retold in detail by indigenous wisemen reiterate the same lesson: that anyone who attempts to kill the valley's animals or drink the valley's water will pay for those transgressions with their life. The only way to enter the high valley without summiting the ring of peaks is through a small passage in the granite rock wall enclosure that becomes blocked by snow in deep winter, hidden above the narrow canyon entryway. Sylvanic's isolation and the Guardian's strict control of predation provides for fearlessness in the valley's animals that must be respected by all visitors who wish to survive the experience. The wisdom of the Elders denies any simple explanation for the high-altitude stone fortress, emphasizing unnatural factors that point to the ancient engineering of this anomaly zone. Sylvanic Valley lies hidden on the northwest side of Storm Mountain (3,095m/10,153' summit) in remote Kootenay National Park, on the British Columbia border with Alberta's Banff National Park. 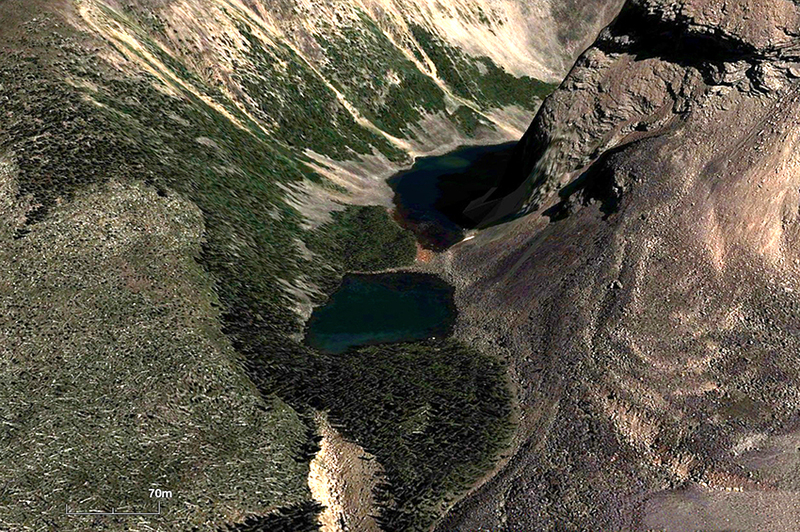 The granite bowl formed by a ring of mountain peaks encloses a pair of small, unnamed lakes. The strategic positions of three Sasquatch lookouts, or day-watchers, repeatedly encountered by Standing during his expeditions are denoted with red dots, while a red circle marks the location of a cave within the narrow slot canyon entry pass, used for shelter by the Guardians of this secret domain (above). The exact geoposition of this guarded valley reveals precision alignment with the other focal points of infrasound resonance forming a global network of ancient piezoelectric pyramids and megalithic sites. Sylvanic Valley (51.216°N 116.015°W) is 6,495 miles from the Great Pyramid of Giza, Egypt; a resonant distance that comprises 26.09% of the Earth's mean circumference (of 24,892 miles). Several related sites extend along this 26.0% alignment, where recent, repeating spates of explosive booming sounds have inundated communities in nearby Ranchlands, Alberta, a Calgary suburb. 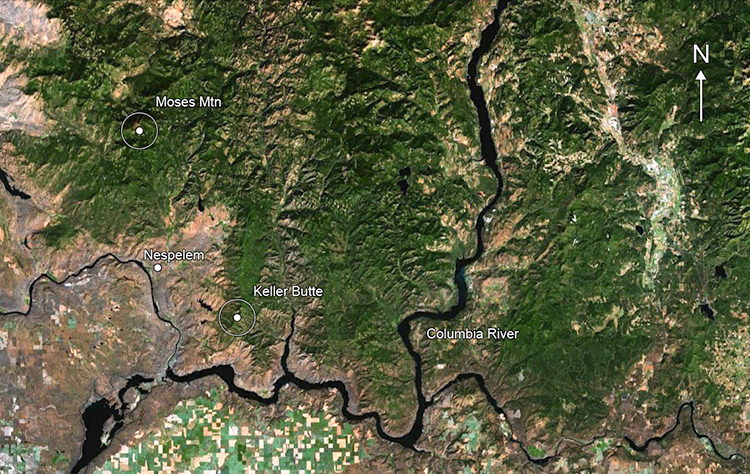 To the northwest are Boom Mountain and Boom Lake, named for the localized infrasound phenomena. The majority of pyramids and sacred sites aligned within the global infrasound network conceal rock entrances to ancient underground tunnel systems. An abundance of fatal incidents have occurred at a great many of these places that are still locally known for the many disappearances of curious visitors. The most recent lethal Sasquatch attack in a long string of similar fatalities in Sylvanic Valley occurred in late 2005 resulting in the deaths of four teenagers on an ill-advised expedition to tranquilize one of the giants. Graphic, unreleased video of the lethal attack was captured by Dan Hamilton --the only survivor of the disastrous 3-day expedition, whose testimony has yet to be published. The most harrowing solo expedition reported by Todd Standing involved an altercation with one of three Sasquatch 'day-watchers' strategically posted at key vantage points in their secluded domain. Unheeded warning growls quickly escalated into roaring and physical threats of lethal force at close range. Any human intruder is easily deterred from penetrating into the Sasquatch domain by thrown boulders and tree logs that serve as an effective demonstration of the formidable strength of these giant, muscular hominins. They growl and throw stones at anyone sleeping in Sylvanic Valley. 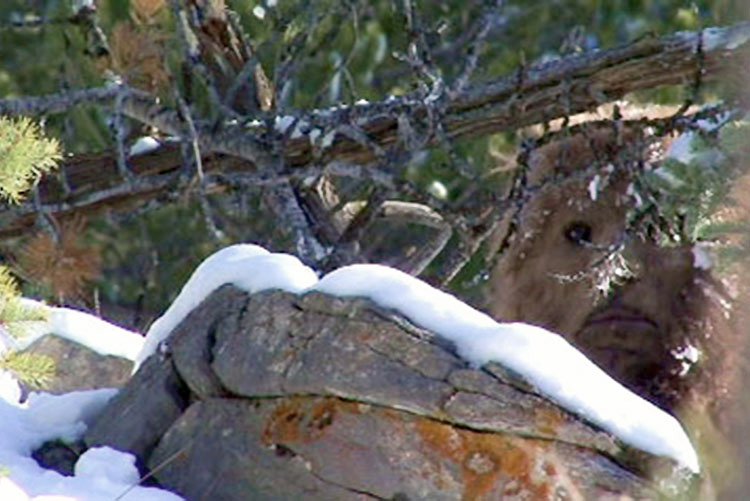 Standing's high-resolution digital photographs and videos reveal the face and reddish-beige fur of a female Sasquatch with a long scar on her chin, peaking behind snow-covered tree branches (above). 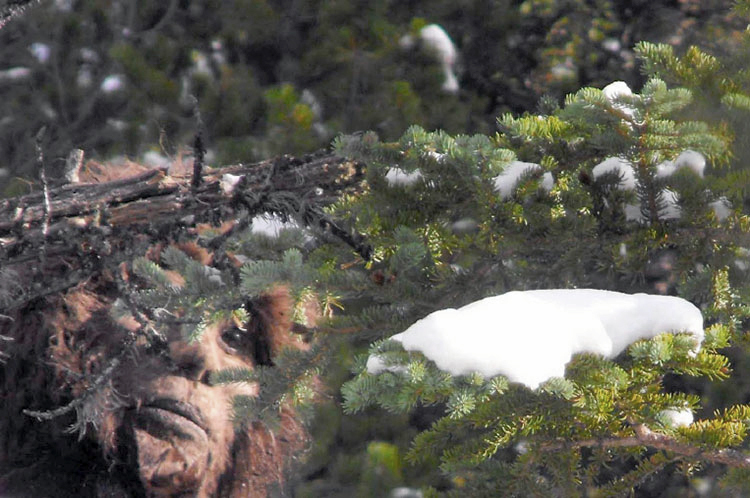 A young adult Sasquatch male with sandy-beige fur was also videotaped during a successful October, 2010 expedition (below). After the 2005 attack, the remote Sylvanic research site had been disrupted by official interference and cover-up. Several hunters were then paid to use gunfire to scare off the resident Sasquatch group. Undaunted, the Sylvanic team continues their research at a separate habituation site in Montana previously developed by a local resident. Clear audio recordings of Sasquatch knocking, vocalizations and speech were made during habituation of a small family group by Ron Morehead, Bill McDowell, and brothers Warren and Louis Johnson, at a remote camp high in California's Sierra Nevada Mountains during the deer hunting seasons from 1971-1976. Newsreporter Alan Berry was invited to audiotape and publicize their remarkable encounters. As the nocturnal encounters developed further, mutual curiosity was tamed by respectful behavioral boundaries that became well established. Distinct modes of speech began to slip out more frequently from the Sasquatch group in the presence of the men, delivered in quick succession between two adults. The pair of furry giants briefly quarreled over the hunters' offering of food scraps using clearly articulated language bursts that are virtually indistinguishable unless slowed down to half-speed. In the final season of recordings, after the Old Man had disappeared and no longer dominated their interactions by rebuking his subordinates, new conversational offerings included raucous laughter interspersed with quite humorous mimicry of our slower form of human speech, in nearly intelligible phrases that have been comically characterized as 'samurai chatter' by crypto-linguist R.S. Nelson. One particularly hilarious recorded incident involved a Sasquatch male banging the camp toilet seat like an oversized door-knocker, while loudly exclaiming: "It's a knocka'!" The notable depth of resonant frequencies produced by the Sasquatch larynx and the intensity of the projected sounds are distinctly non-human, conferring the remarkable operatic quality of their voices. A year-long acoustical analysis of the Berry audio conducted at the University of Wyoming identified 1-3 non-human speakers with estimated average vocal tract lengths of 20.2 cm, corresponding to individuals standing from 6'4" to 8'2" in height (Kirlin & Hertel, 1978). The frequency resonance of Sasquatch whistles are also unique, consisting of a wider range of harmonics than all human whistles, which suggests their likely origin within the nasal and sinus cavities of the giant hominins. Like the growling behavior of large cats, Sasquatch growls produce high level infrasound that can be powerfully felt at close range, causing a strong fear reaction, as does the stench of Sasquatch body odor. In close proximity, roars are also typically used by these forest giants to confuse and stun prey animals by infrasonic bombardment during a surprise attack, or to send warnings at a distance. It was years before this story was told beyond family and a small circle of friends... but more years have passed and in a world today more finely attuned to our Native Americans and the environment, perhaps these rare wilderness voices, whatever their primate origin, would want us to let them be heard. A 95-year-old Miwok, who is known among his tribal council as 'Grandpa', told me that in Yosemite Valley not so long ago, but before his people were driven out, "Bigfoot was known as Oyana Ha'te, and although Oyana Ha'te traveled in the dark, he always had a lantern, or a brightness behind him." The simple words of Native Elders convey profound truths, perhaps unrecognized by Morehead, in this case clearly identifying the presence of luminous objects that "always" follow these nocturnal creatures. 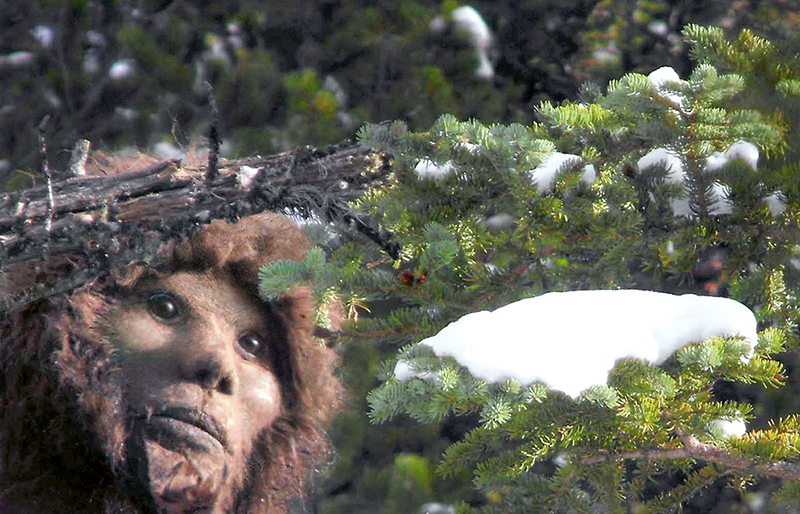 Ancient Miwok cultural knowledge linking Sasquatch with luminous aerial phenomena, labeled today as UFO activity, is based on regional co-habitation with the North American giants for several millennia, and eyewitness accounts from thousands of highly skilled tribal trackers perfectly attuned to the forest. When indigenous trackers observed Sasquatch, they were also keenly aware of a trailing luminosity! The valley's resonant granite walls reflect infrasound standing waves focused onto the area by the Great Pyramid. 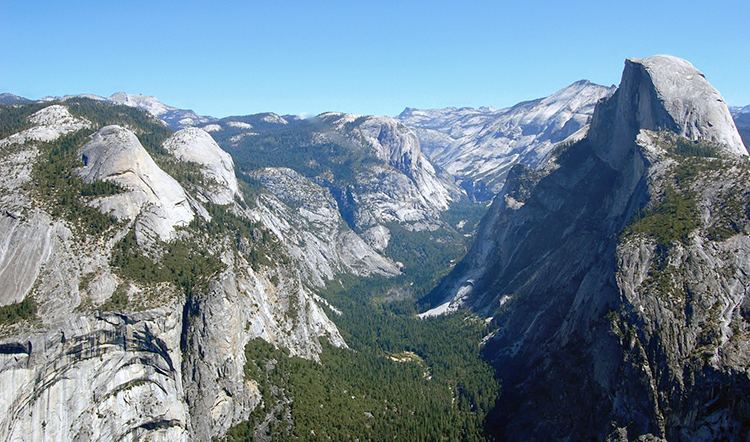 Yosemite Valley, California (37.745°N 119.533°W) is 7,402 miles from Giza, Egypt, a key distance that comprises 29.74% of the Earth's mean circumference. This resonant distance is also shared by Death Valley, where small boulders are dragged in semi-levitation across Racetrack Playa; Calaveras, where a spontaneous explosion recently ignited an extensive wildfire; and Hidden Valley, where luminous aerial objects were seen and photographed flitting above swirled grass formations. The Lake Band of Indians called him "Skanicum" which translates to "Stick Indian". Some Indians referred to him as "Scwe-ney-tum", derived from the original sc'wanay'tex meaning "stick (= woods) Indian". To the Wenatchee Indians he was known as "Choanito" or "Night People". Many believed [he] could turn into a tree. 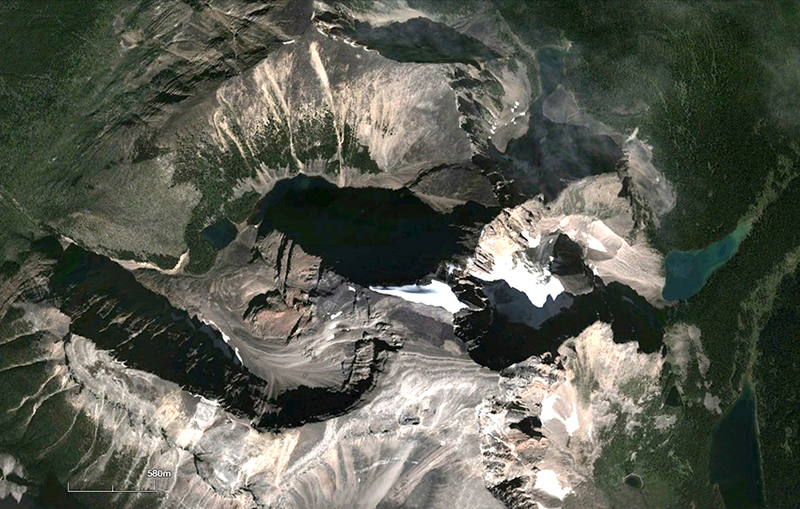 Choanito is still very active in the [Nespelem] area (above). At night lights can be seen moving along the base of a nearby mountain as a pack of them travel along, and many have been reported on Keller Butte. People are always warned to be out of the mountains before dark... The Skanicum was known to often steal dried salmon from the Indians in this area. Skanicum is known to live only in caves... willows over the door. Vince, a 30-year-old member of the Lake Band and a friend of this author, reports that as a small boy his grandfather... took him far up on Moses Mountain to see Skanicum. He was told to be very quiet and he would see them. He did see Skanicum close up and reports: "He was Huge". He knows of a cave going deep into the mountain that is reported to be a home of Skanicum. He has been inside the opening which he states is squared and smooth, appears to have been worked on with tools, and was covered with tree branches. Inside is a strong Skanicum stench. He was afraid to go further into the cave. The high mountain location of this ancient, artificially hewn rock cave entrance still known to the Lake Elders, displays precise alignment within the global infrasound pyramid network. 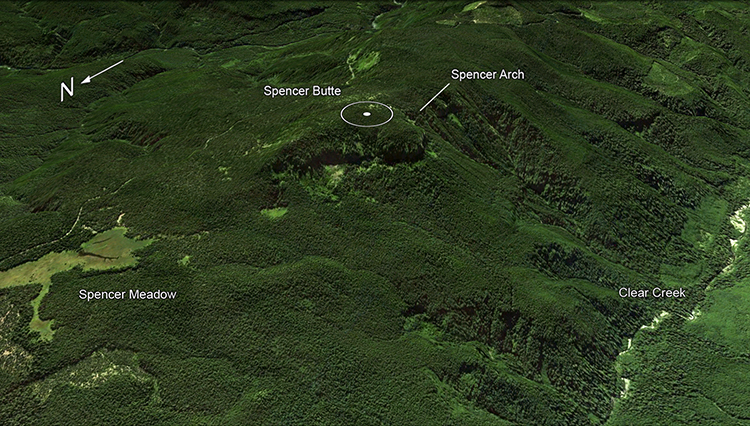 Moses Mountain, Washington (48.376°N 119.054°W) is 6,732 miles from Giza, Egypt, or 27.04% of the Earth's mean circumference distance. Directly to the southeast along this resonant distance alignment stands the impressive Keller Butte (48.074°N 118.785°W) --at exactly 6,745 miles from Giza, or 27.09%. 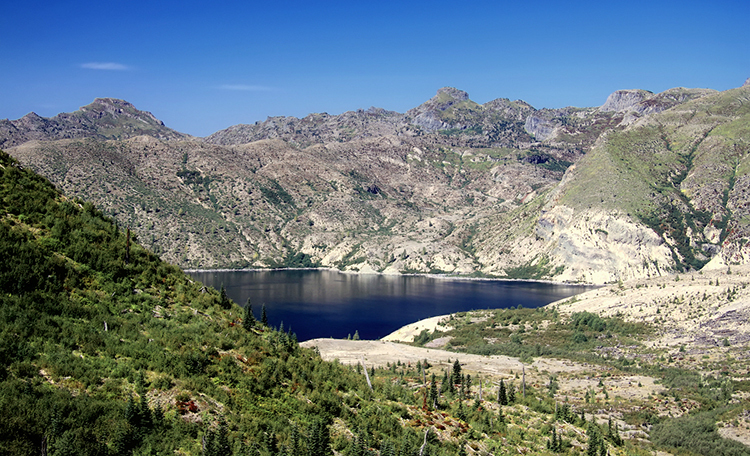 Rarely retold local histories of Sasquatch atrocities emerged after gold prospectors were attacked near Mount St. Helens, just southeast of Spirit Lake (above). Loud nighttime growling and stone-pelting escalated into violent cabin-shaking that incited a miner to shoot one of the aggressors on July 10, 1924, who fell into what is now called Ape Canyon. The miners fled the area at dawn and later surmised that the giants inhabited nearby caves known to them. Reflecting the aggressive protection of natural habitat and resources witnessed in Sylvanic Valley, the 1924 disturbance of small-scale strip-mining operations along the Muddy River near Mount St. Helens brought immediate threats from the giant nocturnal tribe. Consistent behavioral patterns reveal that such brutal enforcement of the territorial boundaries of Sasquatch domains is incurred only when the necessary respect and avoidance of the giants is not strictly observed. 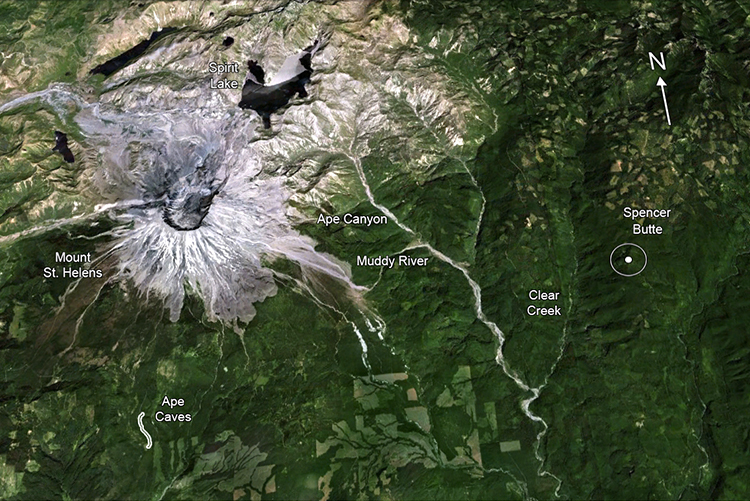 The Ape Canyon attacks that took place to the east of Mount St. Helens were clearly undertaken in strategic defense of natural resources being plundered within the Guardians' forest domain. The big apes reported to have bombarded a shack of prospectors at Mount St. Helens, are recognized by Northwestern Indians as none other than the Seeahtik Tribe of Indians... Oregon and Washington Indians agree that the Seeahtik Indians are not less than seven feet tall and some have been seen that were fully eight feet in height. They have hairy bodies like a bear. This is to protect them from the cold as they live entirely in the mountains. They kill their game entirely by hypnotism. They have great supernatural powers. They also have the gift of ventriloquism, and have deceived many ordinary Indians by throwing their voices. "I had been visiting relatives near Duncan, BC and while there I had been told many stories of the Seeahtiks by the Cowichan Tribe of British Columbia and warned by them not to go too far into the wilderness. However, in following a buck I had wounded I went in farther than I expected. It was at twilight when I came across an animal that I believed to be a big bear but as I aimed at him with my gun he looked and spoke to me in my own tongue. He was about seven feet tall and his body was very hairy. As he invited me to sit down, he told me that I had come upon him unaware and that his mind had been projected to distant relatives of his, otherwise he (Mr. Napoleon) would never have been seen." "He also told me that the reason they were not seen very much was because they had a strange medicine that they rubbed over their bodies so that it made them invisible and that combined with their wha-ktee-nee-sing or hypnotic powers, made them very strong Tamanaweis men. They also told me that they could talk almost any Indian language of the Northwest. The next day they led me out and just at twilight I came out of the underground trail and they accompanied me to within a mile of the Indian village I was staying at." The Seeahtik Tribe is harmless if left alone. However, if one of their members is injured or killed they generally take 12 lives for the one. This the Indians of the Northwest have learned, and even though the Seeahtik Tribe steal all their dried meat or salmon, or even steal their women, the Puget Sound Indians will not try to retaliate, for once the Clallam Tribe in righteous indignation captured a young man of the Seeahtik Tribe at Seabeck, and took him across the Hood Canal to Brinnon, where other Clallam Indians were camped. Kwainchtun, the writer's own grandfather, kept telling the Clallams to be careful of the Seeahtik's supernatural powers, but he was only laughed at. It was later told by Kwainchtun, that while they were still 20 yards from the shore the young Seeahtik made a mighty leap and immediately made for the mountains. Kwainchtun warned his people that they should move but again he was laughed at. That very night the Seeahtik Tribe came down and killed every Clallam there but Kwainchtun, who had moved his family across the canal. The Clallam tribe's forceful abduction of a young Sasquatch male from Seabeck to Brinnon, in Puget Sound, incurred the wrath of an entire Sasquatch band, with predictably gruesome results. 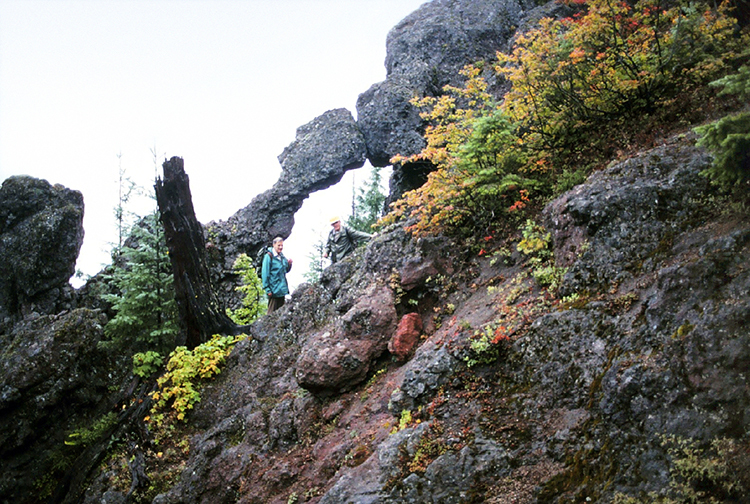 Their cave domain in the densely forested mountains west of Brinnon, Washington (47.70°N 123.00°W) is 6,849 miles from the Great Pyramid, or 27.51% of the Earth's mean circumference. This resonant 27.5% distance alignment runs directly through the Puget Sound area, where repeating spates of loud infrasound booming continue to induce piezoelectric fires and explosions year after year. To the southeast, this alignment extends through Washington State, passing near of a cluster of sites that have long been associated with unusual luminous aerial objects near Spirit Lake. Long before the explosive 1980 eruption of Mount St. Helens covered the entire region in a thick layer of ash and debris, which still covers large portions of Spirit Lake, the area was well known among the region's indigenous tribes for a high frequency of unusual aerial sightings and many encounters with strange humanoid species. News coverage of the Ape Canyon Sasquatch attack effectively refocused the attention of white prospectors on the extensive history of encounters retold by local people. In appearance they were much the same. They were tall, narrow-hipped and had crooked legs, and at the same time were deep-chested with heavy arms and enormous hands. They were covered with thick hair and had large breasts. Their heads were matted with uncut hair and black glittering eyes like the eyes of birds. Their jaws were massive. At one side of them partly devoured lay the carcass of a deer. It was a clear starlight night and he could make them out very plainly, but they were so ferocious looking my uncle said that he did not stay very long [for fear they would notice his presence]." In 1895 the well respected explorer, mountaineer, and author E.S. 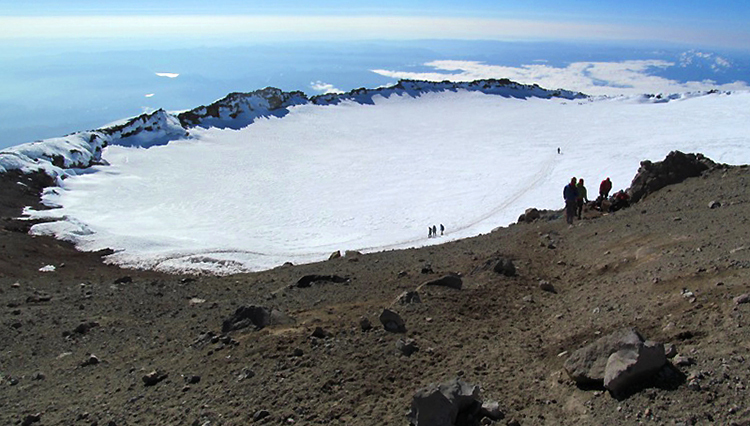 Ingraham returned to Mount Rainier with a companion to once again explore the crater that so fascinated him. While descending into the steam-caves of the crater Ingraham became aware of strange marks on the floor of the cave. They resembled scratches. In some places they were so profound that they looked as though there might have been a struggle or battle between two very angry creatures. His curiosity roused, he looked about in search of other markings in other places. Ingraham noticed that close by, in the earth below him, were depressions which he thought could have come from the pawing of some flat-footed creature. As they descended lower into the cave the frequency of the scratches increased but their intensity did not follow suit. He became aware of an odd sensation as if his body had received a slight electrical charge and wondered if the same phenomena had befallen his companion. Not mentioning anything about his experience or his heightened sense of curiosity he suggested to his companion that they return to their campsite. 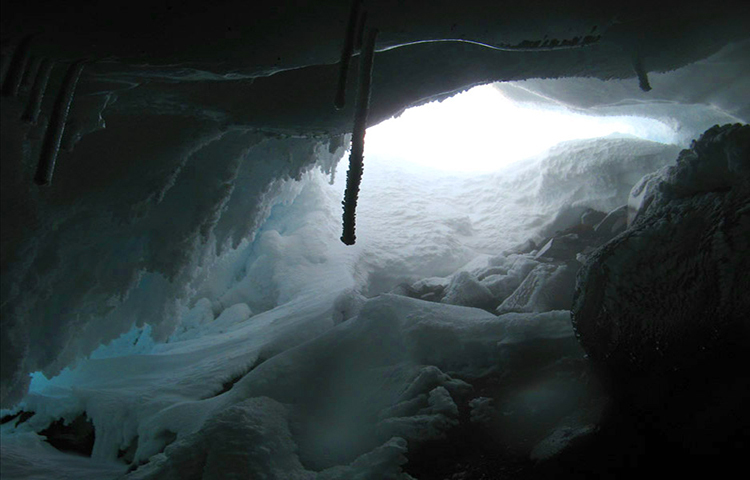 Ingraham had decided to return to the cave later that evening, alone. Later that evening Edward Ingraham arose and quietly slipped out to venture once more into the crater (above). His heart pounding with the anticipation of what lay ahead negated his feelings of foreboding as he made his way to the mouth of the crater and began his decent. The cold night air was soon replaced by the warmth of the steam-cave which reinvigorated his sleepy body and made his tired senses more alert. Edward pushed forward. As he stepped deeper into the darkness he noticed a faint glow that lighted his way, it seemed to beckon him into whatever fate awaited him. He felt as if he was being guided by the influence of a force that distinctly enhanced his knowledge of this unfamiliar environment so much so that he felt confident his footsteps would not betray him. As he moved forward he reached a fork where two avenues of passage lay open before him. At this point a noise sounding like stones rolling down one of the passage ways caused his senses to jump. Quickly stepping into a recess in the wall of the cave he hid waiting to see what would happen next. It wasn't long before the growing sound of something rolling, something crawling, alerted Ingraham while his body tensed in fearful expectation. Then, within a few feet of Ingraham an unusual and grotesque creature tumbled into view. As Ingraham watched the still stumbling creature he noticed the form of it. It was covered with hair but appeared more human than animal-like, and the crown of the head was pointed and bristled with hair sprouting outward in all directions. He also observed the hands and feet discovering that the palms and soles were hard and calloused each with long pointed nails that seemed to shine like polished steel. He realized that while this mysterious creature's form resembled that of a human being... it's line of descent may have been from a separate species. As the creature began to regain it's temperament after it's rather singular appearance it began vigorously rubbing it's hands together causing by degree, an uncanny glow to gradually engulf it's entire body while the most potent centers of which appeared to be the tips of the pointed nails, the eyes, and the crown of the head. It then raised itself and, as if dancing to some imagined melody, began rapidly rubbing both feet upon the cave floor. This action seemed to rejuvenate the creature having the effect of increasing the radiance of the glow that surrounded the creature's body, while also producing a more pronounced potency at the centers of illumination. Involuntarily Ingraham began to mimic the creature's movements and as he did so an odd feeling of fellowship fell upon him. It was at this time that Ingraham's unusual companion first noticed that he was not alone. His reaction to the presence of Ingraham was to repeat his former movements and after having done so, to extend his fingers in Ingraham's direction emitting flashing sparks of light that pulsed from the tips of his long pointed fingernails. Ingraham was amazed as he mimicked the movements the creature had made. His similar actions seemed to produce a like effect but nowhere as powerful as that of the Old Man of the Crater. It was like magic to him! He could see a point of light slowly but brightly forming atop the crown of the unusual creature's head. He felt the top of his own head and he could feel his hair bristling upward and then as if to connect them together an arch of light appeared between them, an eerie radiant force joining them, both Ingraham and this alien being, in complete communication! Two races otherwise unknown to each other were now afforded an opportunity to relate to each other. He did not know how but for near one hour Ingraham received impressions within his mind. Impressions of strange tales of another race, the Old Man of the Crater's race, living within the inner earth, of the customs and upheavals that changed the earth of long past and of a catastrophe that befell the earth destroying all save two and how the two adapted to the new order of things and gave birth to a new race from which he had come. Ingraham called this race the Sub-Rainians. I did not understand how the creature sensed my doubt and disbelief but I felt a strong impression, rather a command, to follow him deep into the inner earth. When he turned to descend into the darkness I gathered my thoughts and with all my power broke free from the spell and without looking back quickly made my way upward to the surface and the safety of my campsite. The odd circumstances of Ingraham's telepathic encounter in the Rainier steam caves invites ridicule and derision, yet his brief account includes several remarkable details could not have been invented. 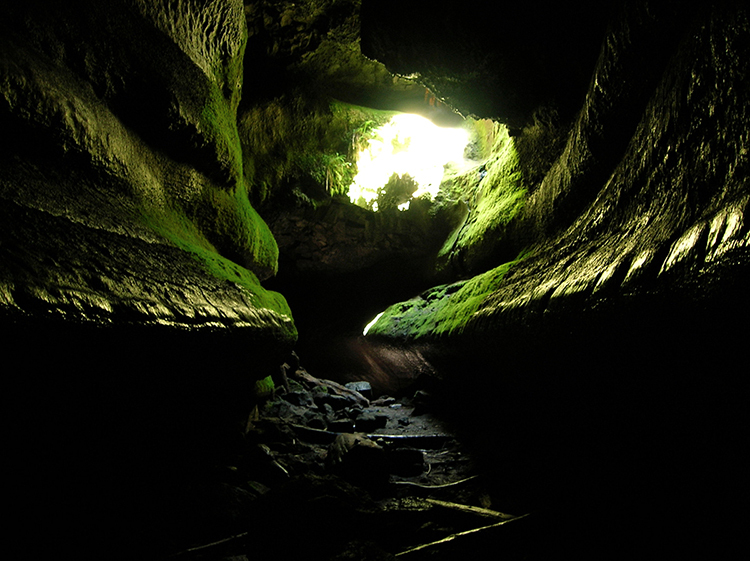 The curious electrical sensation that inspired Ingraham's plan to return to the cave alone, after dark, had most likely been experienced during the explorer's previous visits, yet was not perceived or went unmentioned by his companion. Ingraham's silence on this issue suggests that he had requested his friend's presence in the crater that night for security reasons, as he wanted to return to this site alone to investigate subtle aspects of his experience that could not be easily explained to others. The sound of a rolling stone described by the explorer is explained by many indigenous accounts of large round boulders used by Sasquatch to conceal and block cave entrances or passages, of such a great size that only the portal's giant Guardians may remove it. The crawling sounds then heard by Ingraham were made as the cave giant squeezed through the crack left by the displaced boulder, causing him to stumble out and then recover from the exertion of rolling aside the monolith. 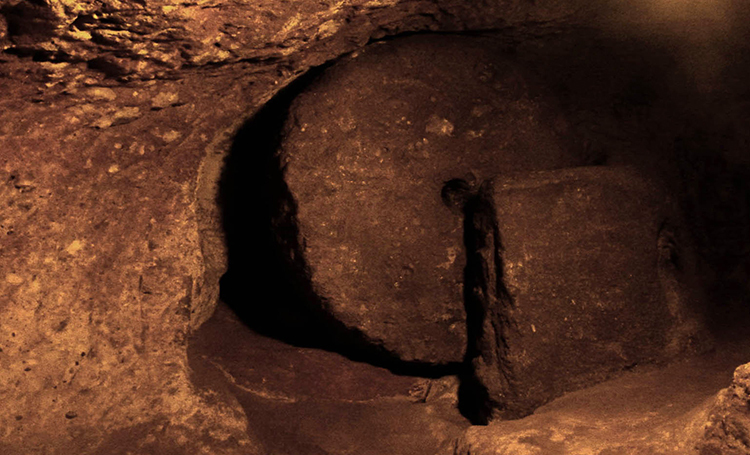 This type of heavy stone door that rolls into place was commonly used throughout the rock-hewn underground cities of Atlantean origin, including those below the Andes mountains inherited by the Inka; in the over 200 ancient subterranean cities located below present-day Cappadocia, Turkey, including Kaymakli and Derinkuyu (above); and in the extensive networks of rock-cut chambers that connect the many psychoacoustic limestone temples on the Mediterranean island of Malta. The 'rejuvenative' motions described by the witness involved quickly repeated limb movements that enhance ionization and natural regeneration of the body's cells. The hand-rubbing and foot-stamping routines of the Sasquatch that marked the floor of the steam cave passage were purposefully used to enhance the piezoelectric charge of the giant's hairy body, causing it to glow and emit sparks. Ionization of Rainier's piezoelectric rock and heated glacier water vapor is enhanced by infrasound standing waves focused upon the crater, providing the special conditions for HHO plasma ignition. Volcanic steam venting through the cave emitted a faint greenish glow forming an arch between them with the same eerie illumination of plasma associated with auroral formations in the high atmosphere. For this same newly recognized purpose, giant granite and limestone basins surrounded the Great Pyramid, and were placed deep within megalithic chambers such as Gavrinis and Knowth, once used as resonators for the acoustic levitation of lightwater and its ignition as HHO plasma. 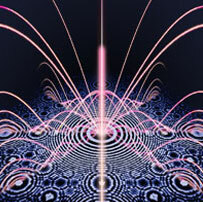 The ionization motions repeated by the Rainier Sasquatch generated HHO plasma around the being's fingertips and atop its head, suggesting ancient Celtic 'riverdance' ceremonies within resonant piezoelectric chambers may have generated glowing plasma around the group of dancers! Longwave infrasound becomes focused onto Mount Rainier because of its geometric relationship with the giant psychoacoustic pyramids of Giza, Egypt. The steam caves of Mount Rainier, Washington (46.85°N 121.76°W) are situated 6,880 miles from the Great Pyramid at Giza, or 27.64% of the Earth's mean circumference distance, presenting clear alignment within the global array of infrasound vortices. The Puget Sound region has become well known for repeating spates of ultra-low frequency booming and spontaneous piezoelectric fires. Cave systems occupied by Sasquatch were known to Puget Sound tribes; Squalicum Mountain (or 'Skanicum') and Big Foot Hill are both named for the giants, located near Mount Baker, Washington. Other Sasquatch encounter clusters near cavesites have also been reported in the Vancouver Island wilderness and around Pitt and Harrison Lakes. 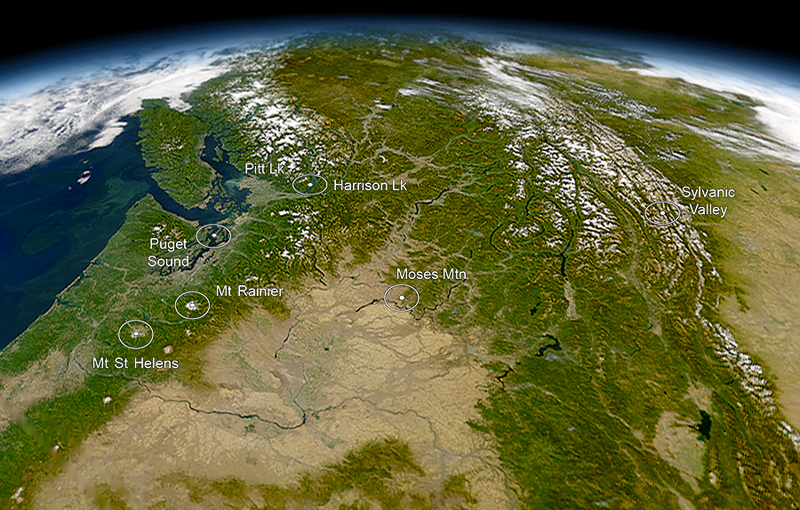 The entire region is located along an axis of infrasound standing waves running northeast through Puget Sound (above). The geopositions of Sylvanic Valley, Moses Mountain, Keller Butte, Mount St. Helens, Spencer Butte, Mount Rainier, Squalicum Mountain, Pitt Lake and Harrison Lake present alignment within the Atlantean pyramid network for heartbeat synchronization, mental telepathy, weather-control and power generation using infrasound standing wave resonance. To this day, the pyramids' symmetries redistribute Earth's natural infrasound fields into resonant bands where bizarre aerial and subterranean phenomena converge. Access to these hidden portals is tightly controlled by the Guardians, whose extreme evasiveness is assisted by highly advanced aerial and subterranean technologies. Portrait masks of Sasquatch made by the indigenous tribes of the Pacific Northwest present many subtle facial details that exactly match digital photographs of the giants' faces obtained under duress by Todd Standing in 2010. 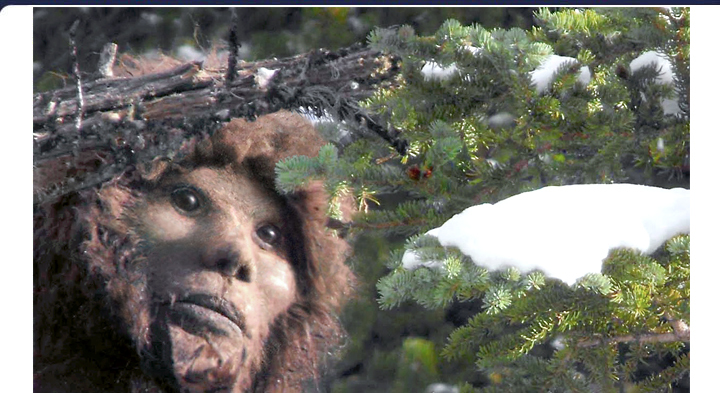 Painstaking removal of tree branches and digital reconstruction of the partially obscured face of a female Sasquatch reveals distinctive features that Native artists have so clearly described (above). The image captures their "black glittering eyes like the eyes of birds" and the great intelligence that enables their fluency in all animal and human forms of communication. Native ancestral knowledge closely echoes thousands of modern day eyewitness accounts of bizarre encounters with strange humanoid beings, often involving luminous aerial objects. The vast majority of such incidents fail to provide forensic evidence for analysis that may verify eyewitness accounts, yet those few ironclad cases that do offer physical trace evidence deserve careful consideration. During her stay with Skanicum the woman became pregnant and bore a son named Patrick, who grew up on the reservation. Patrick's body structure was very different from that of other Indians as his arms were very long, reaching about to his knees. 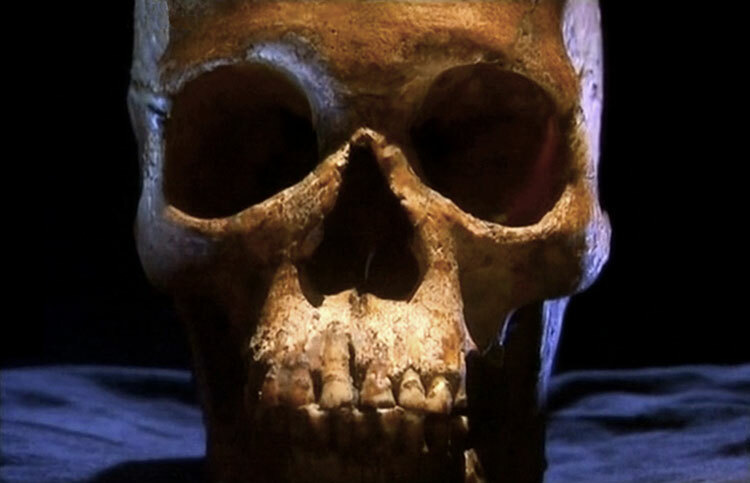 He was very short, about 5'4" tall... possessed a sloping forehead, very large lower jaw, a very large wide mouth with straight upper and lower lips, and straight protruding teeth. He was kind of stooped, or hump-backed. His ears were elongated upwards (peaked) and bent outward at the top. He had very large hands and long fingers, is described as very ugly although extremely intelligent. [A similar incident occurred when] Mono Lake Paiute girls were out gathering berries in Paiute Meadows... [in] northern Yosemite [Valley]... Pahi-zoho had come out [from] behind a tree... He was big, reddish and hairy and she screamed... [as] he took her into the bushes and forced himself on her. She said he stunk so bad, that it was making her sick and it was extremely painful, that he didn't talk but grunted all that time... [H]e snorted and snored loudly all night long and... in the morning he completely lost his grip and she made a quick dash. Now she was safe with her people and her family, but later on she started to show signs of pregnancy... [and] had a son, a big red headed baby boy who was very hairy. The people were scared at first and some of the men wanted to kill him, but... later the people accepted him into the group for he was a good hunter and he had uncanny natural abilities of sight and smell and was very strong. He married and his children came out more normal looking, but every now and then one of his descendents comes out hairy and with red hair. Many of his descendents are now scattered in many of the Paiute tribes in California and Nevada. The long, obscure and violent history of Sasquatch abductions of human women, as well as the existence of hybrid offspring from interspecies breeding, are well known to the tribal Elders of Native American cultures. Genetic study of the many living descendants of such prevalent sexual violence promises identification of Sasquatch genes and their distribution within global human populations. Another interbreeding case began as 'abnauayu' (wild man) sightings near the Adzyubzha River in Abkhazia, Georgia, and provides scientists with the skull of a giant female hominin who was captured in 1850 and partially domesticated. Excavations by Dr. Igor Burtsev finally recovered the anomalous skull in 1975 from a cemetery known to residents (above). 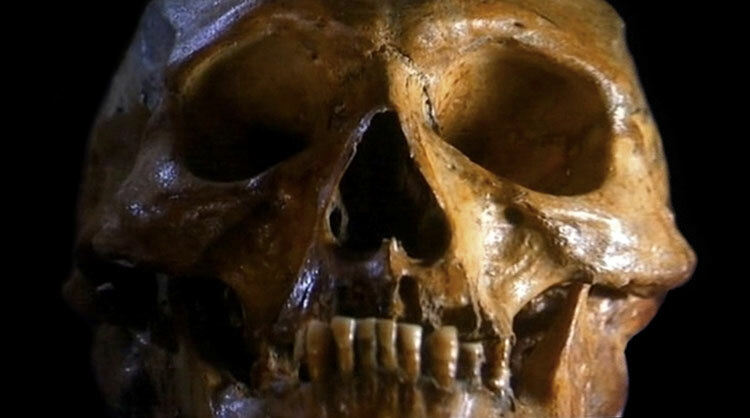 The prognathic skull displays a very flat face, with broad cheekbones and large, widely set eye orbits. The crown of the skull exhibits a slight peak. The manner of her capture is vague. Some said it was not a chance catch [but a planned abduction]. Hunters familiar with an age-old technique tied her up, and, when she furiously fought back, hit her with cudgels, gagged her mouth with felt, and shackled her legs to a log. Probably she had already changed hands by sale when she became property of... a nobleman, Edgi Genaba, who visited the region. He took her away, still shackled and chained, to his estate in the village of Tkhina on the Mokva River, 78 kilometres from Sukhumi. At first Genaba lodged her in a very strong enclosure and nobody ventured in to give her food, for she acted like a wild beast. It was thrown to her. She dug herself a hole in the ground and slept in it and for the first three years she lived in this wild state, gradually becoming tamer... Her skin was... dark grey, and her whole body covered with reddish-black hair. The hair on her head was tousled and thick, hanging mane-like down her back. From remembered descriptions given to Mashkovtsev and Porshnev, her face was terrifying; broad, with high cheekbones, flat nose, turned out nostrils, muzzle-like jaws, wide mouth with large teeth, low forehead, and eyes of a reddish tinge. But the most frightening feature was her expression which was purely animal, not human. Sometimes, she would give a spontaneous laugh, baring those big white teeth of hers. The latter were so strong that she easily cracked the hardest walnuts. She liked to lie in a cool pool side by side with buffalos. At night she used to roam the surrounding hills. She wielded big sticks against dogs and on other perilous occasions. She had a curious obsession for playing with stones, knocking one against another and splitting them. She took swims the year round, and preferred to walk naked even in winter, tearing dresses that she was given into shreds... She was trained to perform simple domestic tasks, such as grinding grain for flour, bringing home firewood and water, or sacks to and from the water-mill, or pull her master's high boots off. But she became the mother of human children, and this is the wondrous side of her life story, very important for the science of genetics. Zana was pregnant several times by various men, and, giving birth without assistance, she always washed the newborn child in the cold water-spring. The half-breed infants, unable to survive these ablutions, died. So, when subsequently Zana gave birth, the villagers began taking the newborn babies away from her in good time, and reared them themselves. Four times this happened, and the children, two sons and two daughters, grew up as humans, fully-fledged and normal men and women who could talk and possessed reason. It is true that they had some strange physical and mental features, but nonetheless they were fully capable of engaging in work and social life. The eldest son's name was Dzhanda, and the eldest daughter was Kodzhanar. The second daughter was named Gamasa, and the younger son Khwit, who died in 1954. 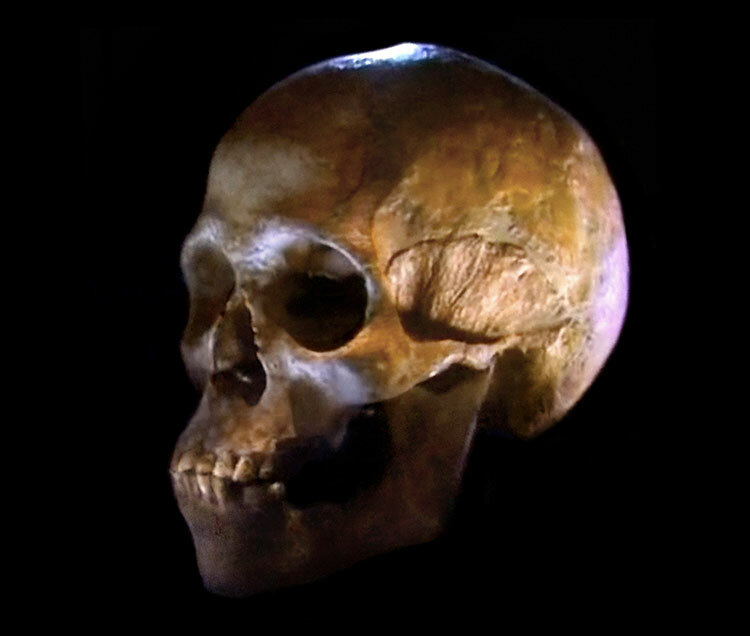 [Khwit's skull was exhumed in 1978 (above).] All had descendants of their own, scattered across Abkhazia. There were rumours that the father of Gamasa and Khwit was in fact Edgi Genaba himself, but in the census they were put down under a different surname, and their family-name became Sabekia. It is significant that Zana was buried in the family cemetery of the Genabas, and that the two youngest children of Zana were brought up by Genaba's wife. Mitochondrial DNA (mtDNA) sequencing of extractions from the teeth of Zana (above) and her son Khwit at New York University yielded modern human sequence consistent with haplotype H, with the exception of a single base variant. This surprising result precludes the possibility that Zana was an archaic hominin holdover from Neanderthal or Denisovan lines having gone unchanged for millennia. Zana's human mtDNA reveals that she is a half-human hybrid, and that her significantly non-human characteristics were inherited from the paternal progenitor, an unknown species of giant primate. For years, purported Sasquatch hairs have yielded the same result of fully human mtDNA that can only be accounted for by species hybridization. The human-hybrid hypothesis is also consistent with the fact that Zana's children were nearly indistinguishable from modern humans, being backcrossed hybrids. Determination of the full base sequence of Zana's nuclear DNA (nuDNA) will reveal the identity of the paternal contributor of non-human genetic sequence that gives rise to her apparent Sasquatch form. Comparative analysis of whole Sasquatch genomes must be established by a wider survey of genetic variation among global Sasquatch populations before any pertinent hybridization dynamics may be identified. While such analyses seem far off, recent findings concerning the vestiges of human-Neanderthal interbreeding provide a new framework for comparison with the Sasquatch hybrids. Comprehensive sequencing of the Neanderthal genome has facilitated clear distinction of Neanderthal sequence interspersed within the genomes of all non-African human populations (Noonan et al., 2006; Green et al., 2010), resulting from a very low interbreeding rate of ~2.5% and high rates of inviability or sterility among male human-Neanderthal hybrids according to Haldane's Law (Mason & Short, 2011). 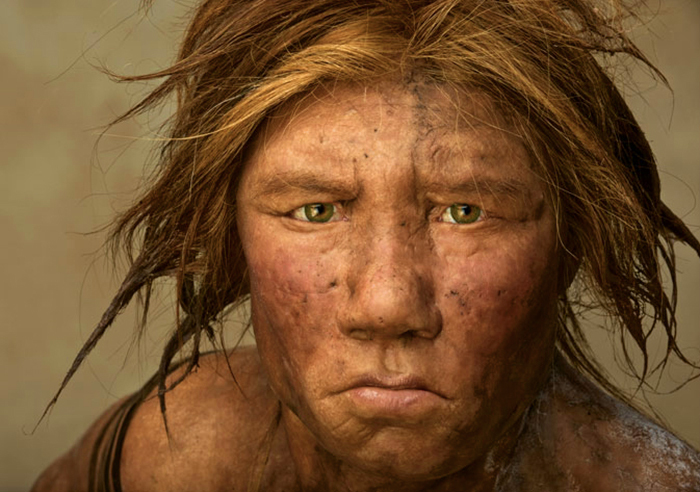 Further studies revealed the strong reproductive isolation between Neanderthals (above) and humans despite thousands of years of co-existence in Europe (Currat et al., 2011; Yang et al., 2011). A study of the date of interbreeding between Neanderthals and modern humans identifies migratory gene flow <100,000 years ago as the likely scenario for the observed interspecific mating (Sankararaman et al., 2012). The researchers estimate a likely interbreeding period of 47,000-65,000 years ago. In the case of Sasquatch, a rough estimate of the hybridization period can be made according to gene mutation rates that mark phylogenic 'branching' events resulting in haplotype differentiation. The fact that both Zana and Khwit showed only one base variation from the human reference sequence is indicative of more recent hybridization at the end of the Pleistocene, some 12,000-16,000 years ago. Subsequent Holocene warming was triggered by meteor impacts that destroyed the Atlantean power grid --a global network of megalithic temples and pyramids for cranial and genetic enhancement during fetal gestation by focused infrasound at the base human heartbeat frequency of 1.45 Hz. Resonant gestation practices induce cranial enhancement like those elongations exhibited by the Pharaonic lineages of the descendant Egyptian culture that dominated the use of pyramid facilities. 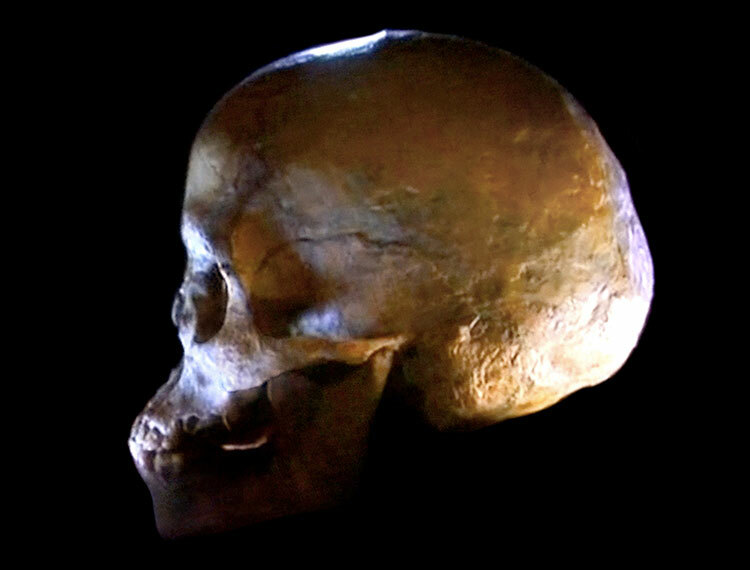 While the skull size of the Sasquatch Zana is well within the human range, no determinations have been published concerning the volume of her unusual braincase, which displays a distinct occipital enlargement that is not consistent with modern human skull morphology. Enlargement of the occipital lobe of the Sasquatch brain most likely relates to enhanced infrasound perception, enabling long-distance vocal communications far below the normal range of human hearing.